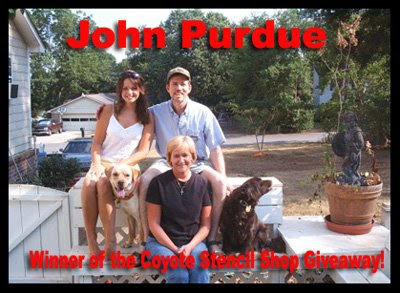 We had the live Coyote Stencil Shop drawing tonight. The show was well attended. I think we had about 50 viewers watching the live video. You can watch a replay of the video on my blog. This was a lot of fun and I want to thank Carving Technologies for their help in making this so much fun. They donated a copy of their fine program for the giveaway. If you are interested in creating portrait style patterns please jump over to their web site and take a look. The picture above shows John and his beautiful family. Congratulation john and I hope you enjoy the program. The entry that John submitted was a project that he did for his wife if I remember correctly. I guess this just shows that nice deeds are returned sooner or later. We had about 30 to 40 people hang around after the show and we talked scrolling in the chat room. Several expressed interest in a regular video chat session. I like the idea and I just might work on something like that. It would probably rather informal but I think it could be fun. Michael Barton was the winner of the $20 Amazon.com gift certificate. During the live video I gave out an email request for entries. It was my way of saying thanks to those who attended. Congratulations gunny and thanks for your participation in the chat after the show. Your gift certificate will be n your email box soon.